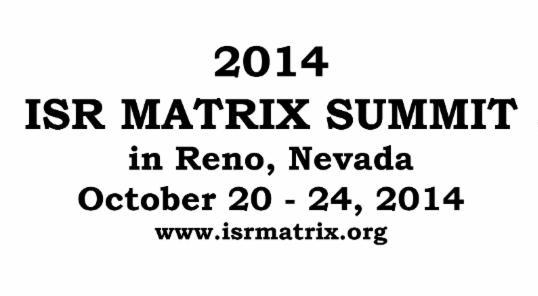 This year our annual ISR Summit was held in Reno, Nevada USA. Five days and over 40 hours of world class training. As planned, predicted and hoped for, this year’s training summit proved to be our finest to date in terms of the variety of material presented and the number of ISR Matrix Instructors and Trainers available on hand to assist with participants. Thanks to the generosity of Kelley Farrell, owner of Conviction Martial Arts & Fitness Center, we were able to run two separate training rooms right alongside several separate teach back groups and simultaneously offer one on one instruction and interviews to potential Instructor Candidates without missing a beat. All those present clearly experienced the company’s cohesion and uniformity of mission within the first few hours of training as participants moved from section to section completely immersed in content and connected to the overall pace and experience. I am extremely thankful to all of the ISR Instructors and Trainers that made it out from Canada, Australia and throughout the states and to the local Police departments and agencies that assisted and supported us with both training gear and personnel. Thanks to you I was able to enjoy what I am most proud of the organization for, the true depth of expertise and familiarity with the material among its members and how you each repeatedly express such great uniformity of instruction, clarity in evaluation and solid measure of results. It was clearly visible everywhere and in every room among all those interacting regardless of professional background or country or origin. Regardless of which instructor was placed with which group or for what topic, it was one system through and through. You proved yet again that it is truly a unique learning approach and language all of its own and how it is made readily apparent and living to all those actively working with it. Within just hours the system’s essential learning approach and pace was in place allowing the matrix of instruction and hidden repetitions, drills and tactics, and even pressure testing and evaluations to instantly become accessible to everyone attending. Everyone looked like a “natural” working hard and enjoying that work because it felt like play and exploration by design. They were allowed to safely but accurately explore what is part and parcel to their universe; the challenge, threat, struggle and risk associated w/physically managing resistance and aggression in close quarters and became eager to do so within the context of the ISR Matrix’s training methodology. As usual, all those attending were initially taken through two days of the ISR Core’s Subject Control program in order to be engaged collectively with the training method and to set the pace for the week’s intensive modular training and instruction. Within the first few hours of instruction and drilling it was as clear when that key moment arrived and the entire place was working in sync and moving as a team to call outs and incremental challenges. Participants kept a solid and progressive pace that balanced between physical and conceptual learning through the integrative blending of strategy and tactics that is the unique and trademark teaching methodology of the ISR Matrix. 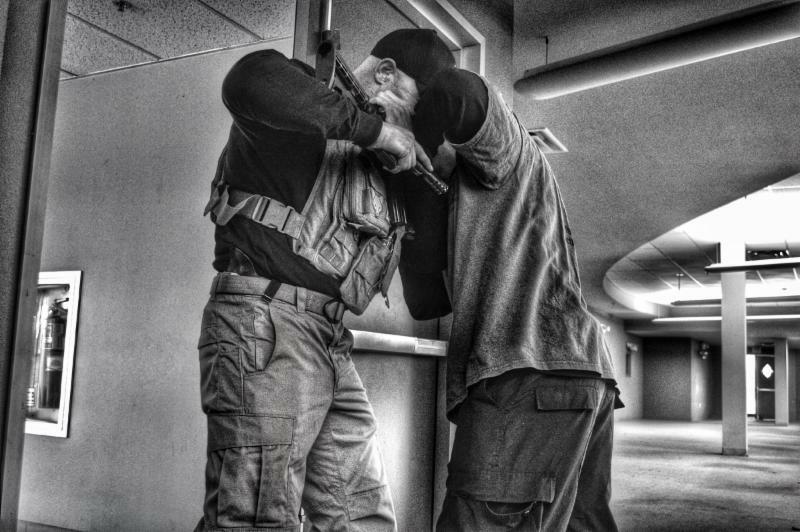 In a room with Law Enforcement and Corrections personnel from both state and federal agencies and from different states and countries, they all looked like they had been training with one another exclusively for quite some time. They quickly became united in effort, movement, and tactical efficiency and most importantly, were having fun doing so. Soon after a few team tactics were shown and after just a brief conceptual introduction of what they would be doing and what part they played in it, they were placed in groups of three or four and started both drilling and pressure testing the set ups, entries and control aspects. Course participants recognized that team control tactics are an area of potentially high liability and negative press and embraced the ISR team control strategies accordingly. Once that standard ISR training rhythm and tone was achieved and everyone was in stride with the core strategy and tactics as working teams, all the Trainers present knew we could move on towards the modular components and their integration in and out of subject control. Firearms Retention – One tactic to rule them all. The first modular program taught after the initial core was in place and understood sufficiently was our firearm retention program. The first modular phase of our Fighting Hand Gun program and the crowning jewel in terms of LE specific DT content, the retention module was presented by Instructor Trainers Ray Price and Peter Caroddo. One tactic and one alone was shown against every gun grab while the weapon was holstered and again and again they very same look I have personally seen hundreds of times presented itself as those attending could not believe how simple and easy it was and why they hadn’t thought of it themselves before. It wouldn’t be long after the initial introduction to the tactic and strategy behind it would be executed by all with enough proficiency to plug it right back into the ISR Core. From the ISR Core they then pressure tested it with varying levels of resistance, specific pressures, and even set ups that they may encounter with the seasoned criminal. By the end of day three everyone present could effectively flow in and out of varying levels of hand to hand pressures as well as deal with a gun grab before, during and after it had occurred. Early, just in time or late to react, the testimonials came in quickly and the one go to tactic held up and received excellent reviews and compliments yet again. The first half of the fourth day brought us to ground engagements and the tactics therein. With three Brazilian JiuJitsu Black Belts and two brown belts and over a century of combined law enforcement experience as part of our Governing Board of Directors, I was very proud to see the ISR’s ground modules looked nothing like self-defense, a sport or an art form but instead emphasized and reflected purely Law Enforcement specific goals with morally and legally defensible tactics up and down the use of force spectrum. From simplifying escapes and pins in manageable portions and adaptable templates to blending in escalation and de-escalation principles along with options from restraints to weapon deployment and contact shooting, all three ground modules were highlighted to some degree. 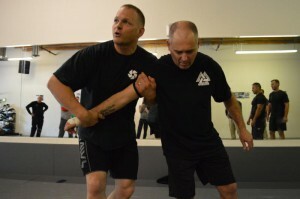 In a very competitive industry that too often follows martial art fads and is carelessly selling “wrestling, jiujitsu and mma for cops”, the ISR ground modules showed 20 years of legally defensible Law Enforcement centered training and DT specific strategies. They did so in a functional learning, training, and teaching platform designed for and taught by Law Enforcement professionals who are as experienced as they are passionate about those very same martial arts. Since the short modular sessions were designed to showcase key points along with general concepts that could later be unpacked and filled in through proper courses, the ground tactics were then shown plugged back into the resolution stages of the ISR Core. Participants could once again see the cohesion and simplicity of the entire living tactical matrix of responses and how they interacted and adapted as circumstances evolved or changed. In other words, it took no change of plan or direction to adjust right back into the material from the prior day’s retention module if called to do so. Be they standing or grounded, pinning or escaping, moving towards tools or preventing their grasp, every one present soon discovered their limitations as well as their possibilities in an often misinterpreted and misrepresented range of combat. At the very least, they were left wanting to explore the range with a new mindset and tactics based learning template to better filter future ground training to better fit their profession. The second half of Thursday had us working in two groups with LE & Corrections training strikes from the ISR Core while Instructor Trainers discussed and reviewed portions of the Clutch QCB CQB system. The Clutch CQB system had previously only been available to military personnel, UC operatives, and specialized teams. The emphasis on both sessions was on seamless striking to and from (in and out) of control positions and through transitions with retention checked and tested with every progressive drill. While the LE & Corrections primarily drilled and re-integrated material, the Trainers’ group was more discussion, question and answer since not everyone present had seen the CQB program’s main training template. Since Clutch will be available in part to civilians in 2015, much of the discussion was about content, and instruction and their ethical and legal considerations. By this day and stage in training, re-integration of new content into the ISR Core and shifting up and down the use of force continuum was almost habitual a response to key Trainer call outs so elements from each day were continued to be inserted onto the original subject control core. The rudimentary process and system became all the more solid and secure as layers and cycles of repetition and modular extensions were plugged in. Every single technique, and activity was directly connected to the first hour of instruction and directly rooted in our first two days of training. Through the consistent switching of training partners, constant changes in scenarios, pace and pressure variables, a true confidence in capabilities was emerging and its appeal was clearly contagious. Participants had done hundreds of hidden repetitions by now and spent hours upon hours on their feet being asked to keep it going but if anyone would have walked in for the first time it would have looked like the first day as far as the energy level and passion for the learning. We were entering the final stages of new introductions to material and could not be more pleased with the results thus far. Close Quarter Battle – Deploying the weapon mid fight. Weapon deployment was then introduced, isolated and pressure tested among those qualified. 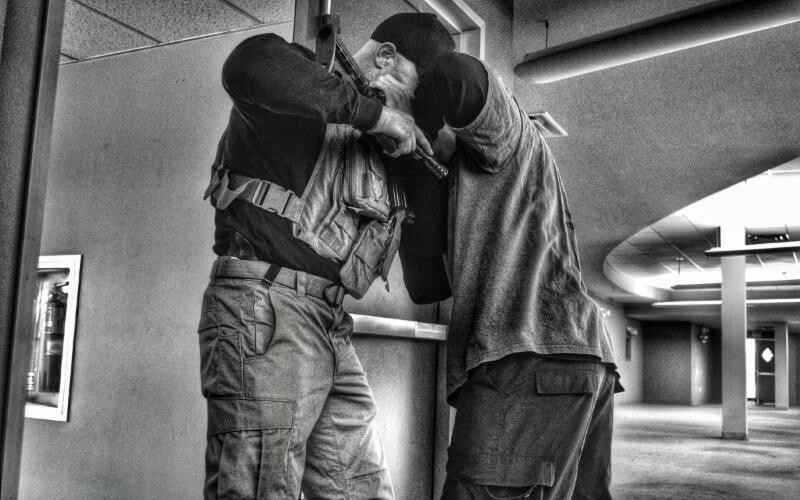 Using specific drills and pressures, firearm tactics were uniformly re-integrated into hand to hand scenarios. Then weapon retention or deployment were called upon through specific integrations of counter-tactics and built in interruptions to enforce dynamic adaptability within the system and bring a tested and true confidence to those training it. The key lesson stressed was adaptability and strategic mobility. Though new to most, they all quickly saw the bigger picture and conceptually understood how it tied right in with the rest of the ISR Matrix and where it best served and operated. Nothing but the sudden necessity to escalate further had changed in regards to the ISR Core and all of their training to date. Almost instinctively, they instantly discovered where they had to be or go regardless of tactical glitches, situational circumstance or consequence of action. The new Clutch tactics once in place simply emerged from their working matrix as dictated by the predicaments they found themselves in and most importantly, the degree of their effectiveness or lack thereof could easily be discussed, reverse-engineered and trouble shot afterwards to see where they missed a space or moment in the action. Friday would be dedicated to brief introductions into other modular programs that much like everything to this point, would plug right into the ISR Core. These sessions were typically two hours in duration and served to show where the ISR Matrix goes and what it builds and supports as it is mastered. We began with the first phase of our counter knife module which once again, kept the tactic to a dynamic singular approach that connected immediately to our strategic point of view. With no fantasy scenarios or assurances, participants were shown how to work the material and soon recognized that their odds were greatly being increased as they went through the drills. Though simply a piece of the initial counter-knife module, we pressure tested what was worked on and threw in a few curve balls to see how everyone reacted and sure enough saw a uniformity of performance and self-correction in progress. The second modular program shown was our UC intra-vehicular disarms with a focus on controlling the hand and tool alike and getting the weapon pointed back into the subject or their accomplices while defending against secondary threats and strikes. Again, one tactic and again great results when trouble shot and pressure tested among those new to it. Vehicle extractions were next with several tactical considerations by SRT and SF veterans who had worked the material for years over seas. We worked cover, proper subject control from outside the vehicle door/ window, and partner and team control and entry options dependent on scenarios, local laws, and rules of engagement. Problem solving and some pressure testing was demonstrated through various passenger and vehicle configurations. Last on the final day’s agenda was our first ever certification presentations for Subject Control Instructor and Subject Control Instructor Trainer status with the ISR Matrix. With a long set number of training hours required alongside the strictest of performance evaluations, I was honored to award these men our first line of certifications. They have proven that they have what it takes to properly promote the training and performance oriented tactics and strategies unique and inherent to the ISR Matrix to all levels of student and across all fields requiring the physical management and control of subjects.